One of the big problem in image registration/structure from motion/3d tracking is using global information of the image. Feature/blob extraction, like SIFT, SURF or FAST etc using only local information around the point. Region detector like MSER using area information, but MSER is not good at tracking textures, and not quite stable at complex scenes. 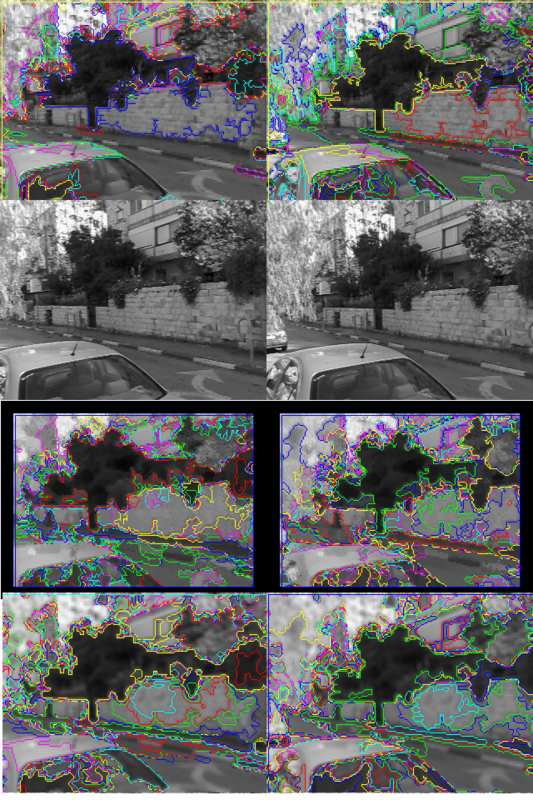 Edge detection provide some non-local information, but require processing edges. That could be computationally heavy, but looks promising anyway. There are a lot of methods which use global information – all kind of texture segmentation, epitome, snakes/appearance models, but those are computationally heavy and not suitable for mobiles. The question is how to incorporate global information from the image into tracker, and make it with minimal amount of operations. One way is to optimise tracker for specific environment – for example use the property of cityscape, a lot of planar structures and straight lines. Such multiplanar tracker wouldn’t work in the forest or park, but could be a working compromise. The problem is that regions seems not stable enough and way too big. Mean shift filtering seems capture more feauters, but it’s too computationally expensive.